Development of sound forest roads is one of the major parameters influencing overall timber harvesting activities within the perspective of sustainable forestry. 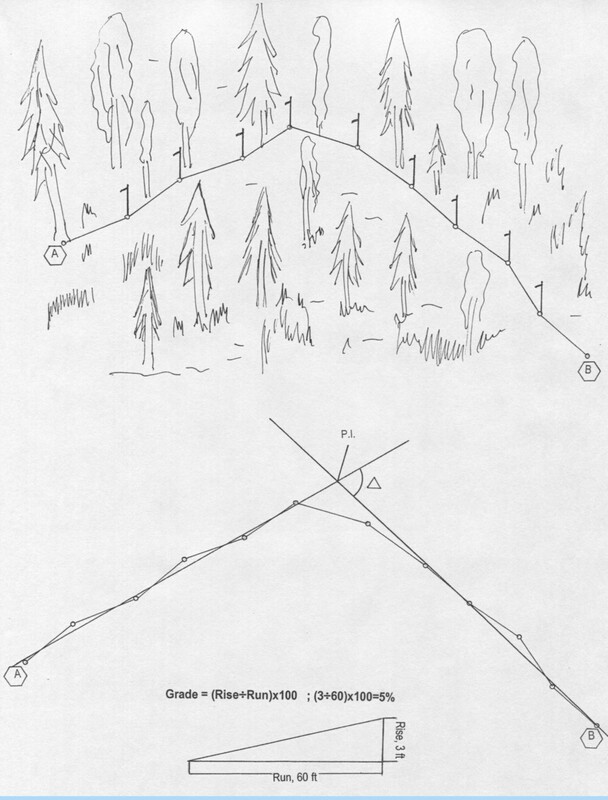 This fact sheet summarizes some of the main aspects of forest road surveying, establishing curves and determining overall road length and profile of the road. 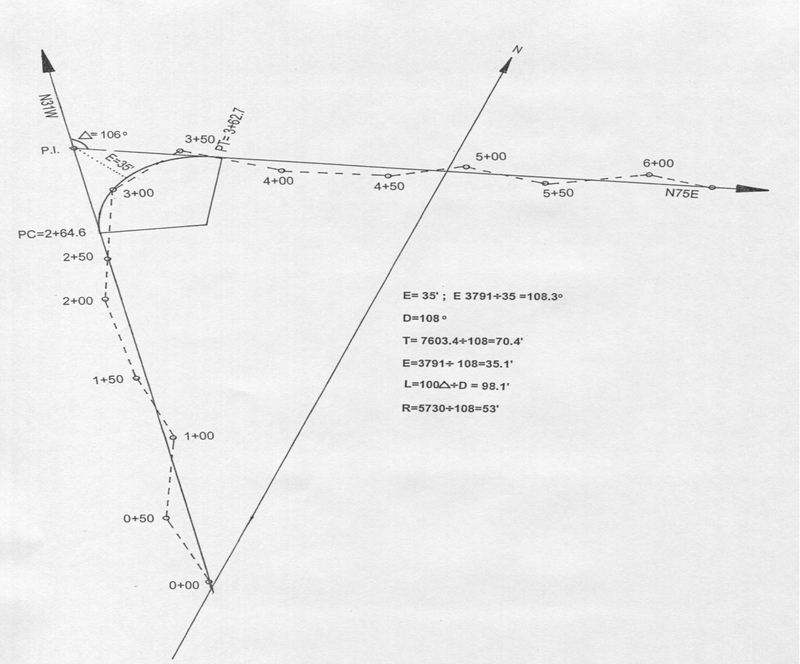 Gradeline is the route establishing a survey line to follow a typical forest road. It can be easily determined by a two-man crew using a clinometer (abney level) and flagging. While one man holds the flag at eye level, the other person can determine grade using a clinometer. Usually the clinometer person moves ahead to determine his grade point by looking back at his eye height of the other person and station that is marked by driving a stake.Stakes are driven at predetermined intervals, which is usually around 50 feet and identified as an individual station. 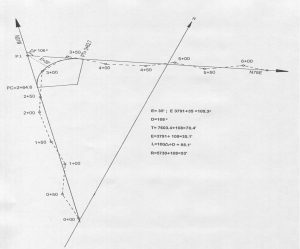 When establishing the grade line, it is important not to exceed maximum grade limits depending on overall topography of the site. Figure 1 shows a schematic of gradeline in the field. Tangents of the road are established by dividing a zigzag configuration of the gradeline into equal portions as much as possible. Once tangents are identified, curves of the road are determined based on the intersections of two tangents, which is the point of intersection (PI), and complete centerline of the road is established. Depending on topography of the site and distance, there could be several or more curves on the road. Point of intersection of each curve should be marked by stakes in addition to each station. Bearing, which is the location direction and target point of each tangent, also should be determined using a compass. Figure 1. 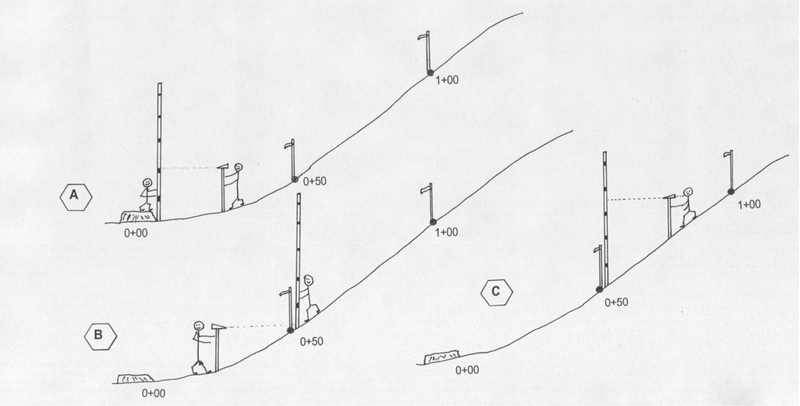 Schematic of gradeline in the field. Delta angle for each curve is calculated in the next step. Required parameters for each curve, namely external (E), point of curvature (PC) and point of tangency (PT) are calculated to determine geometry of each curve. External is the distance between PI and the closest point of the curve, and it is determined by measuring in the field. Derived from delta angle and E value, degree of the curve, which is defined by the angle subtended by 100 feet in the curve, is calculated based on table values. Figure 2 illustrates an example of establishing the centerline and calculations of curve parameters. In this example, the total length of the road will be determined by measuring from the first station to PC plus the length of the curve and distance from PT to the end of the road, which is the last station. When all measurements are obtained in the field, they are added together, and the total length of the road is determined. Also, data gathered in the field are transferred to engineering paper in the form of a scaled drawing so the parameters of the road can simply be quantified. Figure 2. Establishment of centerline and calculations of parameters of the curves. Most of the time forest road construction require excavation; therefore, road design should done so the amount of earth needing to be removed at the centerline should be optimized to have a smooth slope. Road profile also determines the amount of earth to be cut and filled on the slopes. Since both activities will increase overall road building cost, cut and fill portions should be minimized as much as possible. 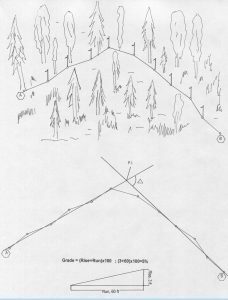 Road profile also can be determined by a two-man crew using clinometer (abney level) set at zero degree and leveling rod. A person located between two stations having the clinometer set on an eye-level stick will read the numbers on the leveling rod from both directions, sequentially. Back side reading and foresight readings are recorded, and the profile of the road is developed. Figure 3 illustrates the process of collecting data for the road profile. Two simple equations shown in Table 1 are used to determine direction of the road, either uphill or downhill, to get the road profile. Based on data collected, overall slope (grade) of the road is determined. Figure 3. 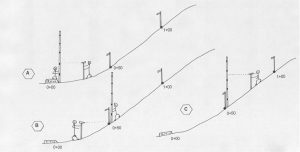 Process of collecting data for the road profile. Issued in furtherance of Cooperative Extension work, acts of May 8 and June 30, 1914, in cooperation with the U.S. Department of Agriculture, Director of Oklahoma Cooperative Extension Service, Oklahoma State University, Stillwater, Oklahoma. This publication is issued by Oklahoma State University as authorized by the Vice President, Dean, and Director of the Division of Agricultural Sciences and Natural Resources.